Thank you very much for inviting me to be a guest blogger on Crochet Addict UK and for taking the time to read this entry. I realize that it is long and wordy but hope that it will be of some assistance to you. I’d also like to voice my concern to those of you living in flooded areas of the UK, my thoughts are with you. 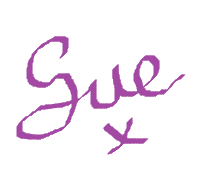 Finally, see the end of the post for my time sensitive gift to the readers of Crochet Addict UK. It’s really IS what’s on the INSIDE the counts…..
How many times have you slaved over a toy or amigurumi pattern only to find that after all of that hand cramping work the little project just won’t sit securely? 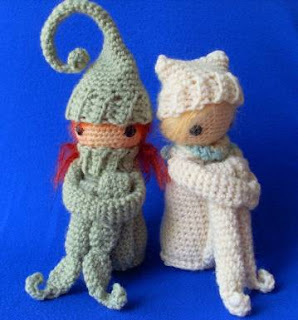 Often times this is because the design is top heavy as many amigurumi are, with their big heads and little bodies. Or sometimes it’s just the size, shape or makeup of the design itself. There is nothing wrong with top heavy or oddly shaped designs. That’s how they are supposed to look, it’s a large part of their charm. So what to do? Obviously the critter needs some weighted stuffing. But sometimes it’s not enough, as in my Knee Huggers pictured here. I THOUGHT that weighted stuffing would be enough but their bottoms are not very wide relative to their bodies and even with heavy gravel stuffing they were easily knocked over. This could prove to be very frustrating as they are designed to be decorations and will have to be re-positioned over and over if left as they are. Let’s first talk about the weighted stuffing. 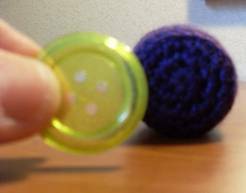 We all know that plastic pellets, found at craft and fabric stores, are designed for providing weight in crocheted, knitted or sewn toys, but they are expensive. 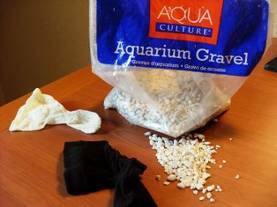 What I use is un-dyed aquarium gravel, which is found at any pet store or discount store selling pet supplies. 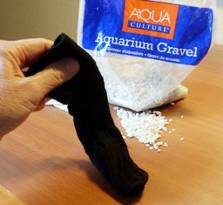 It is less expensive, comes in a larger bag and because the gravel is heavier, a lesser amount can be used. I love that, as 1 bag lasts for SEVERAL toys. When using weighted stuffing I always contain it by placing it inside of the toe of a knee high hose, ( also a great use for pantyhose that are no longer wearable due to runs). I purchase knee high hose in a variety of colors, for 33 cents a pair at a local discount store. If you are going to use this procedure don’t forget to get various colors for maximum invisibility. Have you ever finished a toy using super tight tension only to have a bit of stuffing show-through because of the sharp contrast between dark yarn and white stuffing? 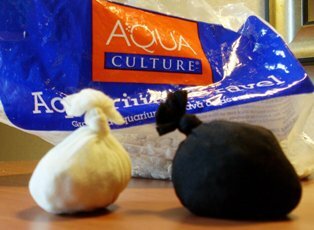 Undoubtedly most of you are familiar with the procedure of making a weighted stuffing packet for toys. Depending upon the project, for a small to medium sized toy I use approximately 2 tablespoons of the gravel placed in the toe of a knee high hose. Then tie a looped knot creating the gravel packet. For extra protection against the sharp gravel, I fold the hose back over the packet and tie it again, creating a 2 layered gravel packet. Place this in the bottom-most portion of the toy to be stuffed or where required and proceed stuffing with your stuffing fiber of choice. OK, so I’ve done all of that and my critters STILL don’t want to remain securely and firmly seated. How frustrating. Where the design permits, these toys need a firm, FLAT surface on which to sit, something inserted into the design that will keep the crocheted fabric flat against the stuffing. In the case of my Knee Huggers, their bodies are basically cylinders so they would benefit greatly from a firm, circular insert. One way to make a flat insert form is to cut a shape, the same size as the bottom gusset of the toy, out of cardboard. This works beautifully. Just be sure to punch 2 holes in the center, as on buttons. Use these holes to sew the insert to the inside of the piece to prevent it from shifting around in the toy. In the photo below the example on the left has only weighted stuffing. 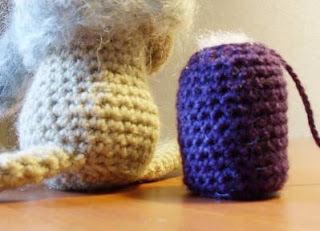 Notice how the bottom of this toy bows out, thus creating wobbly base, while the example on the right has a flat, firm base after inserting a firm, flat object before stuffing. Another idea for creating a flat insert is to use a large button. I just happen to have a LOT of extra large buttons that I am not really that fond of, as buttons go. But, they are perfect for this application; they are large enough, already have holes for attaching, are very flat on one side and I’m using up something that has been lying around in my craft room for years. If you are going to use the buttons they must be the same size as the bottom gusset of the toy. After utilizing both of the fore-mentioned techniques in my Knee Hugger toys I STILL had a bit of trouble keeping them firmly seated. How frustrating. Luckily I stumbled upon a technique in a pattern I was using a few weeks ago and it works like a charm. After the body is completed and stuffed with the cardboard (or button) gusset insert and the weighted packet of either gravel or plastic pellets and all sewn up add what I call a “flange” to the bottom of the toy. In this case the “flange” is simply a round of single crochet(U.S. terms) added to the leftover loops from the gusset portion of the design. Simple, simple, simple but so effective. Notice the round of single crochet at the bottom of the example on the right in the photo below. Now they are firmly seated and ready to sit around my house for the holidays. As a gift to the readers of Crochet Addict UK, I am giving away free copies of my Knee Hugger pattern, which is scheduled for publication on Ravelry, in conjunction with this blog post. 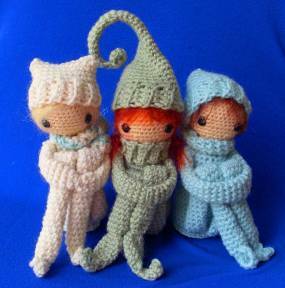 Just fill in CrochetAddictUK when “purchasing” or downloading the pattern. The coupon will only be good until December 4, 2012. If you do take advantage of this offer, please do not circulate the pattern. Hope one and all has a wonderful holiday! I have already downloaded it. her post and please go and visit her links.